WOW! 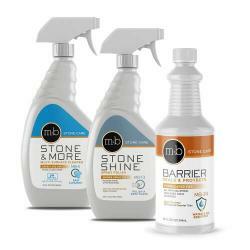 We really like this product! Marble repair and granite repair kit quickly and easily fills pits, chips & nicks for virtually invisible marble repair, granite counter top repair, Silestone repair, quartz counter repair, Corian and other solid surface countertops, floor tile, tub & shower tile, travertine, limestone, slate, onyx, all natural stone, and porcelain tile for level horizontal surface repair. **Up to 10 small repairs. NOTE: For granite repair & marble repair (Silestone, travertine, slate and all stone) on vertical surfaces and countertop edges use the Granite & Marble Repair Kit - Paste (click here). Marble & granite repair of chips and pits used to be a major pain even for professionals having to mix epoxies or resins, trying to match the stone color and waiting hours for it to cure. The usual result was a sticky mess and a very obvious marble or granite counter top repair. This Marble & Granite Repair Kit eliminates all of that hassle providing far superior results by using an advanced, clear, light-curing acrylic (LCA) gel that allows the natural color and pattern of the stone to show through, so you get a virtually invisible granite repair, quartz counter repair or marble repair... fantastic! This clear, flowable, acrylic gel comes in a ready-to-use syringe with micro-tip applicators, so you can easily fill 5-10 small blemishes (5-10) without any mixing or mess. 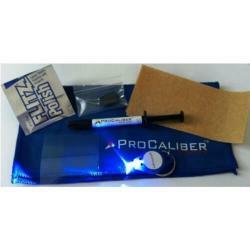 After applying the gel a simple LED pen light (provided in the kit) is used to dry and cure the gel in minutes. 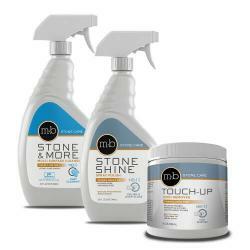 Once cured the acrylic can be sanded and/or polished with materials provided in the granite & marble repair kit. 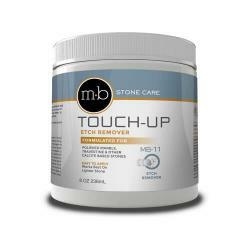 Use For: Level, horizontal surface repair, countertops and floors, granite repair, marble repair, quartz counter repair, Silestone, Corian and solid-surface countertops, travertine, limestone, slate, porcelain, floor tile, shower and tub tile pit, chip and deep scratch repair. NOT suitable for light surface scratch repair or shallow surface blemishes that do not provide sufficient surface area for the product to effectively adhere. Light surface scratch repair on granite requires re-polishing by a professional. 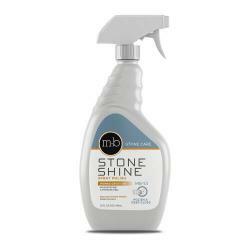 On marble use the Marble Polish / Etch Remover (click here) for light surface scratch repair. Free Shipping: You will not be charged shipping costs on the Granite & Marble Repair Kit, which ships separately from all other products. However, a handling fee may still apply and shipping costs for any other product(s) ordered will still apply. 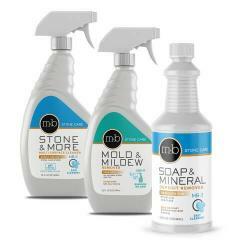 This product is fantastic! Our kitchen countertops are "rain forrest marble" which is shades of green with brown veining. We got two small chips in them recently and I was extremely worried about how to fix them. After reading these reviews I decided to give it a try. It worked beautifully! The gel took on the color of the marble and you cannot see any trace of where the chips were. Also, it's very easy to use. Highly recommend! Your product worked awesome, exceeded expectations and customer support is fantastic! Just used granite repair kit, excellent results! Thanks! I can say that your customer service is exceptionally good. Many thanks for your swift response to my concerns. The kit was easy to use and the results were great. It was way better than spending $225 to fix a small chip. Great product. I was really surprised that it worked better than anticipated. Would recommend highly. We had an estimate of $300 to fill a small pit less than half the size of my little fingernail, so we decided to try your product instead. I was concerned that we might put too much gel in the pit and see a bump or that we might sand the gel area and damage the counter top. Neither of these things happened. You can not tell where we made the repair! 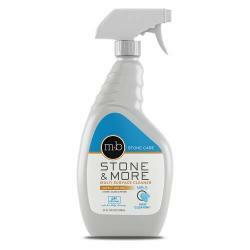 My husband used this yesterday to fix our chipped Silestone countertop, and it looks like new. We are very pleased with the product. Excellent! Fixed the small chip in my silestone sink. Chip is no longer noticeable to the naked eye. the product holds well and is easy to work with. Not much product in the tube. ********** ADMIN COMMENT: Coverage will vary with size and number of pits. Average pits are the size of a small pea. Kit contains enough product to fill 5-10 pits. I was very pleasantly surprised with your customer service. I had a problem with a Pits & Chips: Marble & Granite Repair Kit (clear gel)you were willing to send a replacement right out to me. I am not sure if the cause of the issue was a product defect or user error but you quickly resolved the problem for me. Your Customer service was very pleasant and professional. He is truly an asset to your company. This was the first time I ordered a product from your company. It will not be my last. Thank you again for your excellent service. Great product. Better than expected result. My personal tip...remove tape, especially blu painters tape, before sanding so tiny bits of tape dont get along edges of gel.